We hope this guide makes it a bit easier for you as you plan out your weekend in Charleston. This Charleston Bachelorette Party Guide is well, meant for bachelorette parties visiting Charleston but we hope that it helps for anyone or any group planning a trip to the low country. We created an amazing guide for you to use while on your Charleston bachelorette party weekend. If you are in the planning stages of thinking about what to do for your bachelorette party and thinking of picking Charleston, SC as a place to spend your bachelorette weekend, we highly suggest checking out our guide to get an idea of how the locals think you should spend your Charleston weekend. We figured we would help you in your Charleston weekend planning with our list of favorite places to spend Brunch, Breakfast and Coffee here in the Charleston area. We will keep this list updated as much as possible to reflect our favorites as things open and close so you stay in the loop! This Charleston weekend guide would not be complete without a section just for the local Charleston makers. We think their products would be great bachelorette party favors for your Charleston weekend. We love adding in some local Charleston love to your bachelorette party favors. 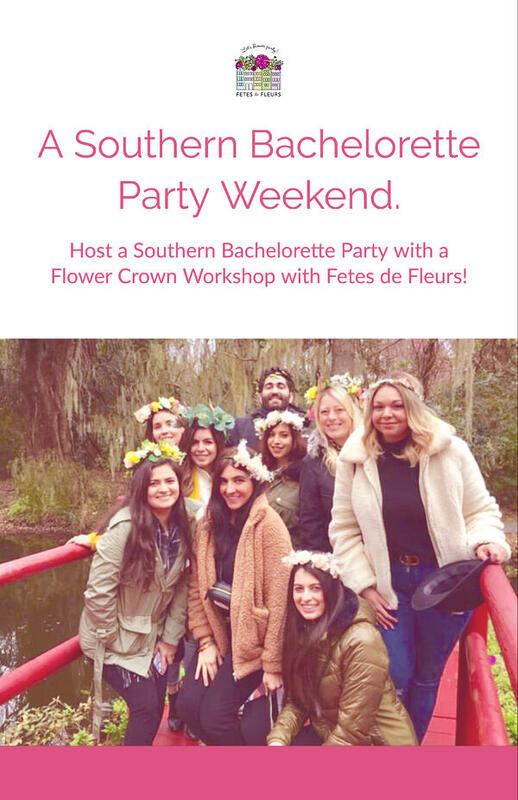 If you are looking to add in local Charleston brands and goodies as bachelorette party favors we have the best line up of local makers for you below. We moved here in March from Boston and have been working our way in and around bachelorette parties since then. 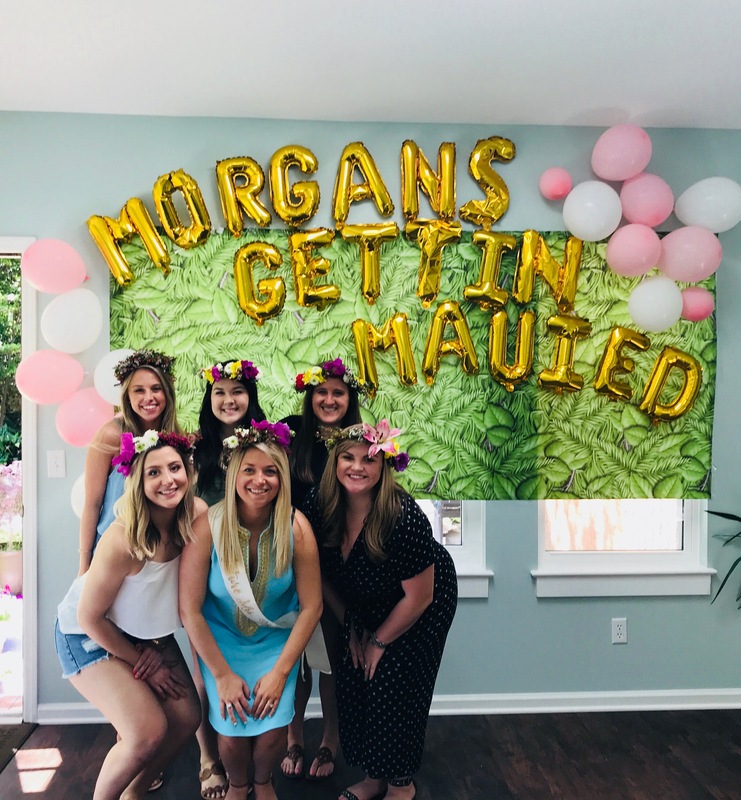 In the process we have tried and done so many fun things that we think all bachelorette parties would want to know about! 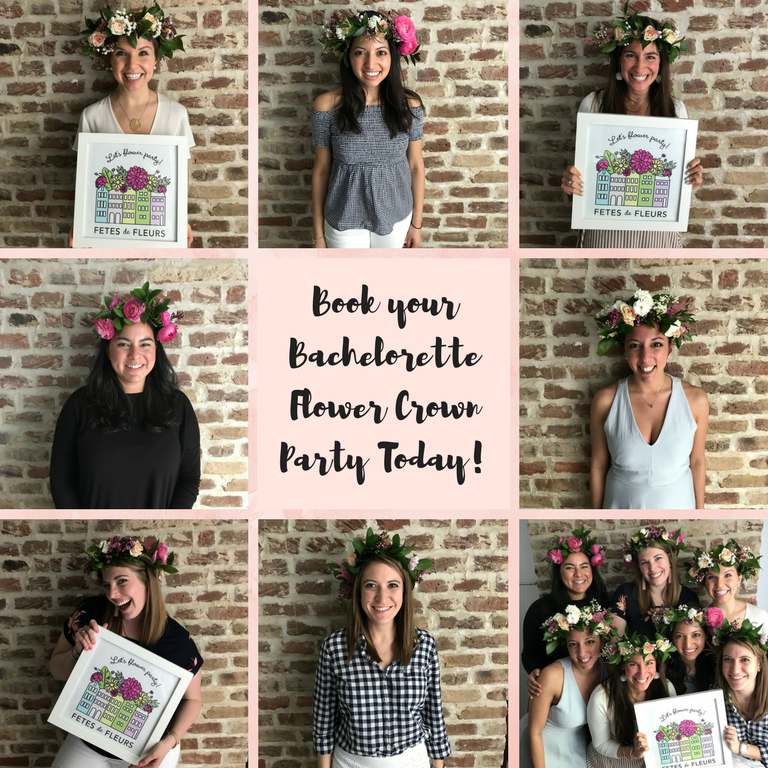 We want you to have the Charleston bachelorette party 101 on what you should be thinking about as you plan out your Charleston bachelorette party weekend and your Charleston bachelorette ideas. We had the pleasure of working with a group of 10 ladies celebrating their bestie who is getting married in Florida in September this Saturday afternoon here in Charleston, SC. They wore the cutest t-shirts that said: Bachelorettes & Champagne & Lipstick & Charleston! So so so cute! I loved these girls. They had a flower theme going for the whole bachelorette weekend here in Charleston complete with the t shirts they wore that Saturday while shopping on King Street to flower garlands around their Charleston rental house and a flower photo background that they hung on the wall for their photos. Hi there, Toni here, 1 of the 3 Charleston Bachelorette Party Hosts! I had such a busy and amazing Saturday here in Charleston, SC where I hosted twoFlower Crown Parties. We had a total of 7 flower parties this past Saturday here inCharleston and in Austin, TX. That is so amazing and cool to see the growth of Fetes! Book your flower party here. The first one was Crawford's 5th Birthday Party where mom & daughter duos created crowns to coordinate with the adorable birthday party that was fairy themed. More on Crawford's birthday here. Next up was Angelica's Bachelorette Party! 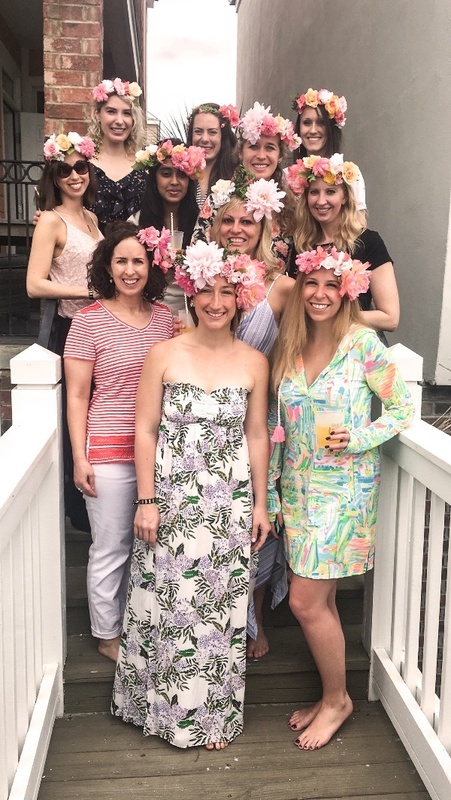 These ladies were so fun to hang out with; a tight knit group of girlfriends and cousins laughed, sipped on Rose and crafted gorgeous flower crowns with some of local SC flower farmers prettiest flowers from our signature Flower Crown Bar. Not every bachelorette party wants to do crazy things all weekend. Some bachelorette parties like to keep is classy, and relaxed. For those kinds of more grown up, more relaxed bachelorette parties we have the bachelorette idea for you. The classy, relaxed bachelorette party screamsflower arranging. We had the chance to head out to Seabrook Island here a couple of weekends ago to celebrate a classy gal's bachelorette party here in Charleston. Now I love a good bachelorette party right in the middle of the downtown Charleston, but can we talk about how perfect having a bachelorette party is that’s RIGHT on the beach? We highly recommend checking our Charleston beach Airbnbs as you plan your Charleston bachelorette party weekend. Hi Flower Babes! Toni here, one of Charleston's Flower Crown Party Hosts! 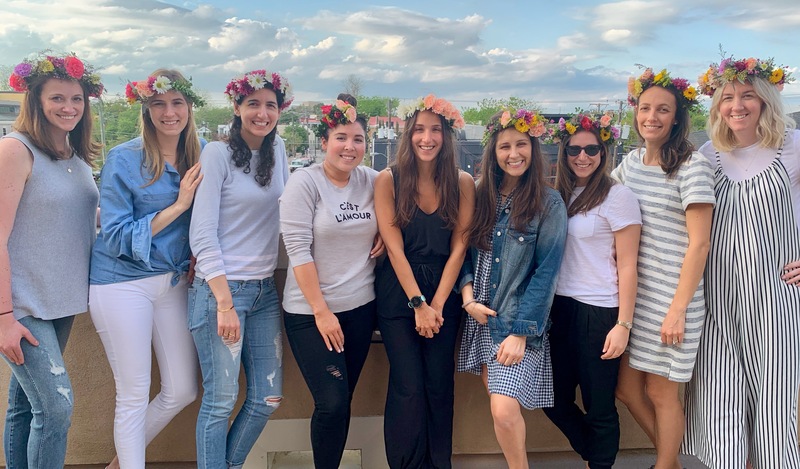 On Saturday my first Flower Crown Party was with a group of ladies celebrating Sahar's bachelorette weekend. This group of laid back ladies booked us through Pop the Bubbly who designs and organizes bachelor and bachelorette weekends in Charleston! 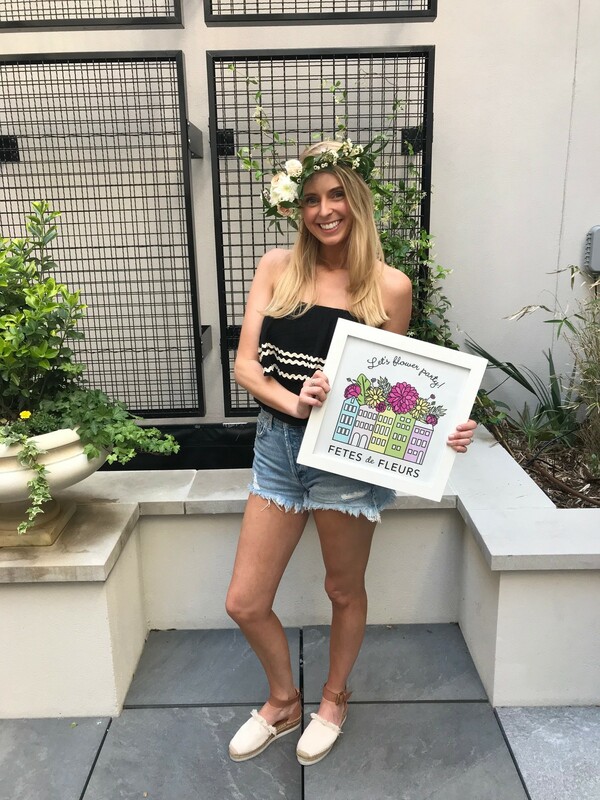 We love her company and all she does for Charleston bachelorette parties so check her out if you need more help planning your weekend in Charleston. 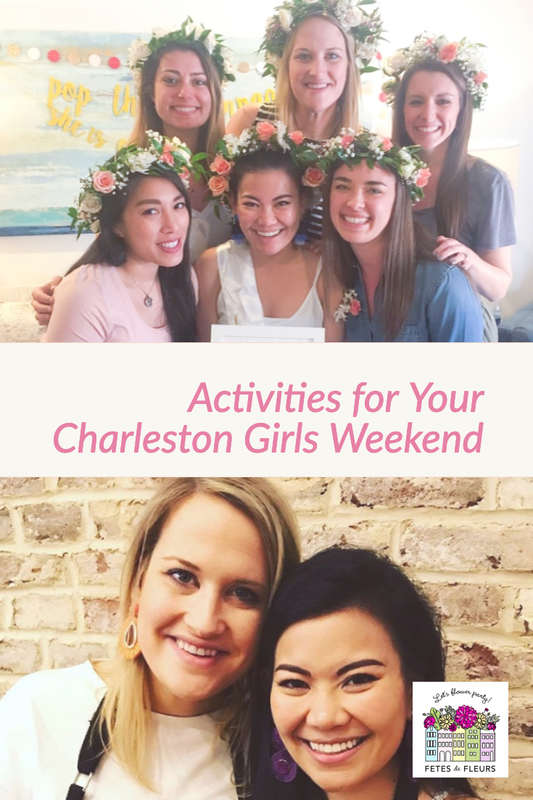 You can also check out our 2018 Bachelorette Weekend Planning Guidefor more inspiration on fun things to do around Charleston while here on your weekend. Before & after pictures are a breeze with a group of beautiful ladies adorned with their newly crafted flower crowns! We always set up our signature Flower Bar and the console table behind the couch was the perfect spot for these ladies to lounge in the living room, sip champagne and create their crowns. A few more snaps of the girls carefully selecting their flowers and creating their masterpieces! Angelica's tribe didn't leave one detail out when planning the bride tribe's weekend here in Charleston. 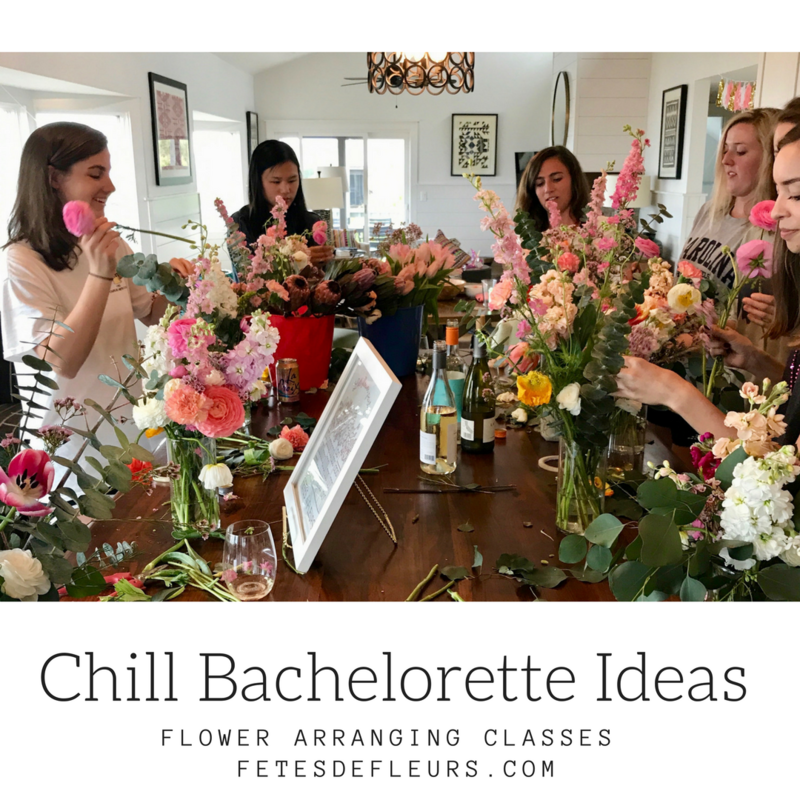 Don't forget to check out our Charleston bachelorette party weekend guide here where you can find all things recapped about our Charleston bachelorette partiesthat we host! Hey flower babes - Toni here, one of Charleston's Flower Party hosts! This past weekend was full of Bachelorette Flower Crown Parties and Ali created gorgeous arrangements for a wedding! I was able to host two parties downtown Charleston and my second one was at the gorgeous King 583 which is a hotel on King Street. It is prime time in Charleston to get your bachelorette party on. We are so pumped to help all the bachelorette parties coming to Charleston with theirfun activities for their bachelorette weekend. We went to an airbnb to put on a flower crown bachelorette party with a tropical twist out in West Ashley last Saturday. The bachelorette theme for this party was "Morgan's Getting Mauied!" How cute! We love a tropical theme because that fits in so well with flower crowns. 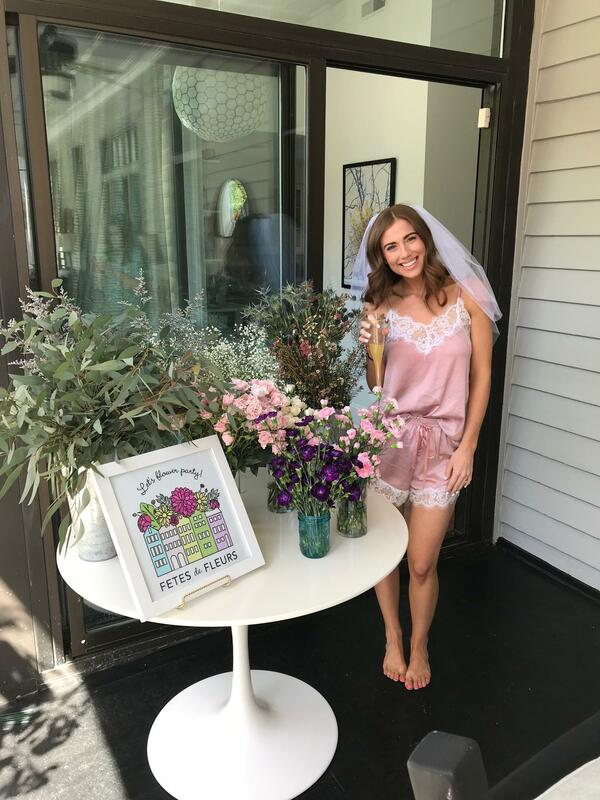 Remember, if you are thinking about doing a flower crown party as part of your bachelorette party we will ask you what colors of flowers you are looking for and try to work within that when we source your flowers. Last week I met up with McKenzie and her bride tribe at an amazing historic house downtown on Rutledge. Confession- I totally nerd out over all the architectural details found in these old historic houses and this Charleston AirBnB did not disappoint. okay, back to the fun party details! McKenzie had 9 amazing friends surrounding her & surprising her withactivities all weekend. Upon arrival the ladies were sipping champagne from their mimosa bar and getting their next level avocado toast ready all while rocking the cutest pajamas! That's right, it was a brunching, pajama wearing,flower crown making kind of morning. Once the girls surprised McKenzie that we were making flower crowns , we settled it and got to creating. 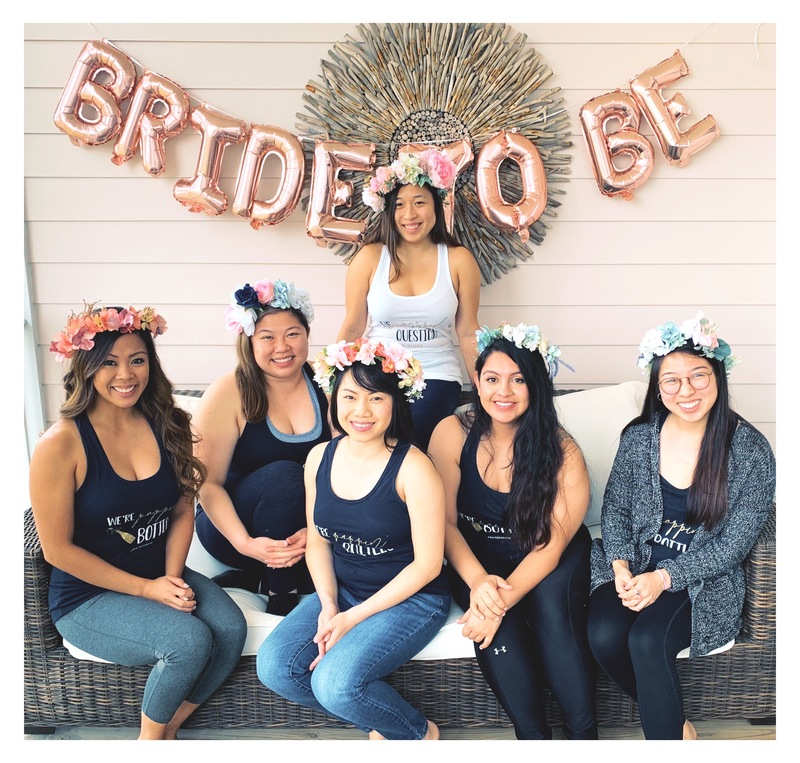 We love to help our bachelorette parties in the cities that we are in celebrate the special bachelorette party weekend over a fun, girly activity making flower crowns. 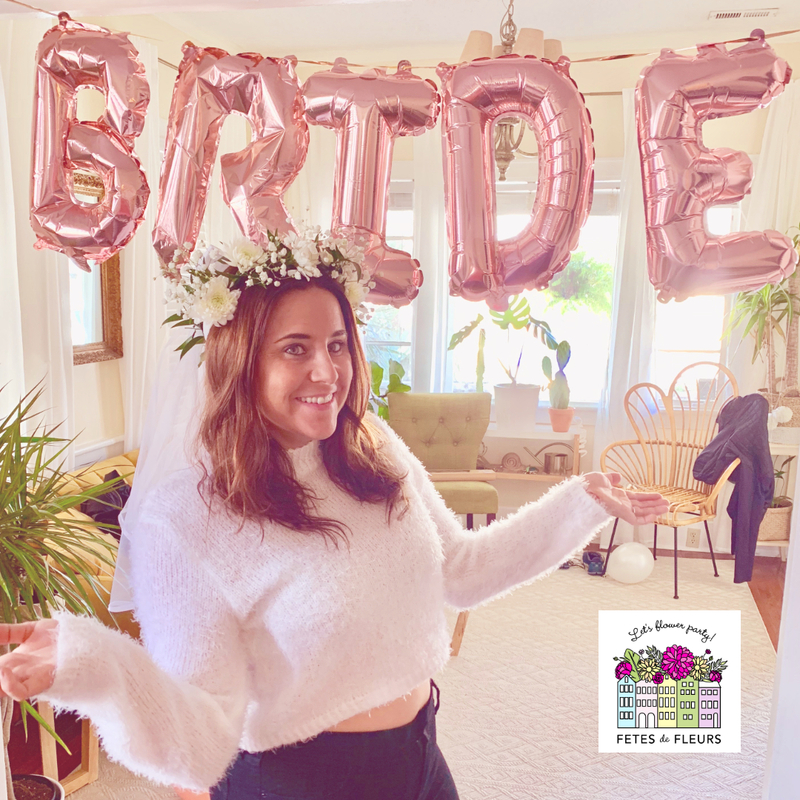 We typically are booked up in most cities each weekend throughout the year so make sure if you have a bachelorette party coming up or a girls weekend or any other celebration that you want to maybe have a flower crown party for please reach out to us (ali@fetesdefleurs.com). 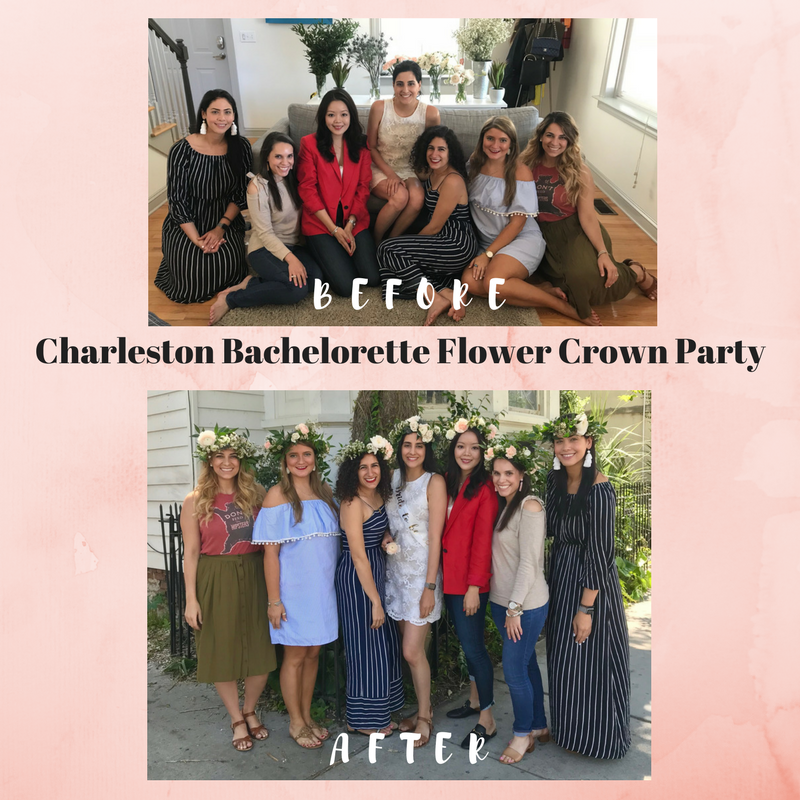 We had a great time this past weekend for a Charleston bachelorette party making flower crowns with a group of 8 ladies and one BABY (Yes a baby was on the bachelorette trip)! You have decided to come to Charleston, SC for your bachelorette party weekend!!!!?!?!?!? Say, YES, YES, YES we have! WOO HOO- we cannot wait to have you here and meet you all. We have good news for you lovely ladies coming to our fine city...we have some very, VERY cute instagram worthy spots for you to take cute photos in Charleston. Did you know Charleston has a ton of bloggers and influencers? Yes, that is also a known fact. We are home to lots of bloggers and influencers who have really made it easy to pick up on the instagram worthy places here in our city. Since our founder (me here writing this) lives in Charleston, SC it is easy for us to round up our favorite spots. 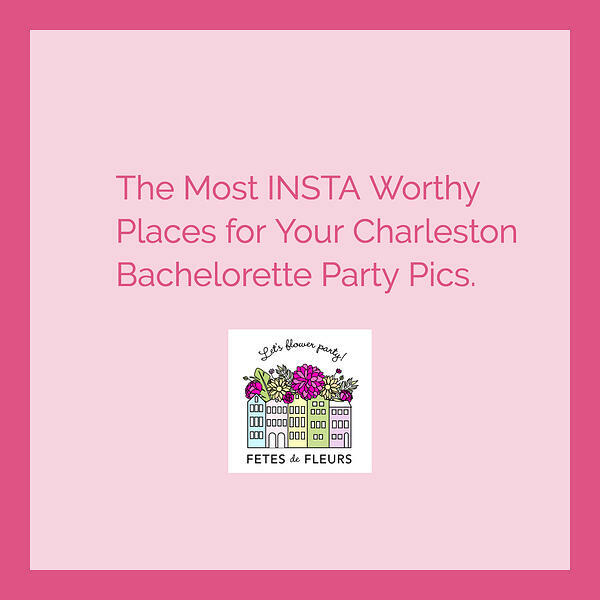 These will only be pretty places where we would suggest going to take some instagram worthy photos on your Charleston bachelorette party weekend. Coming to Charleston, SC? GOOD. You will of course love it here. It is a lovely place with lots of great weather, food choices, many things to do, fun to be had, a cute downtown and well, BEACHES to experience. You have great options on where to stay for your Charleston weekend. You have to think about where you want to spend a majority of your time while in Charleston. 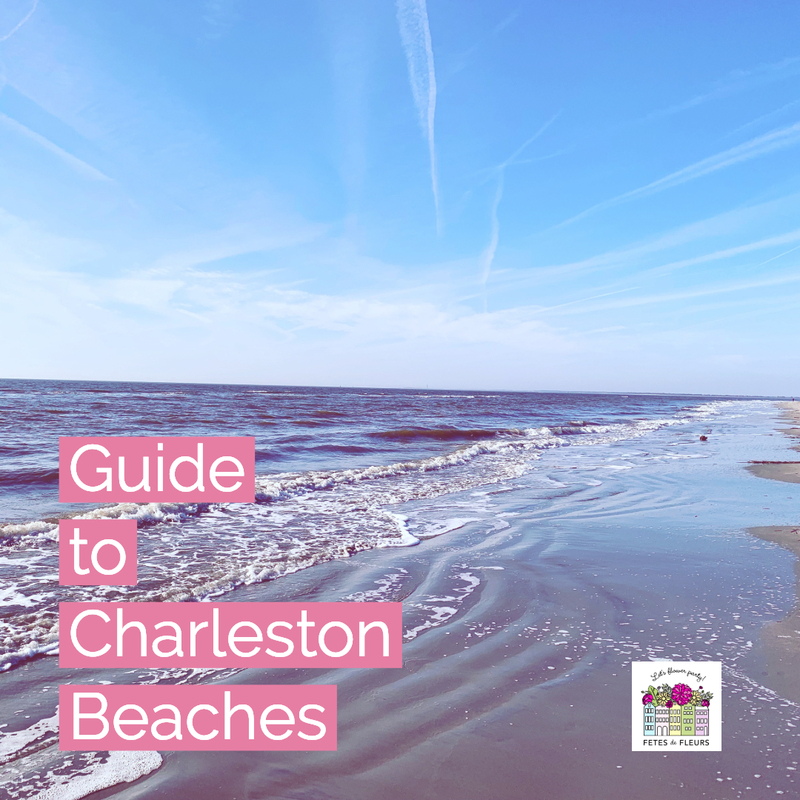 Do you want to be out at one of our beaches and spend your time at the beach enjoying the weather and the waves or do you want to peruse downtown Charleston more? We had a great time this past weekend with a group of ladies who were here from all over the country to celebrate a bride to be's engagement for her Charleston bachelorette party. This group of 6 ladies stayed out at Folly Beach. We love Folly Beach because it is off the beaten path of downtown and well, you have the beautiful beach right there for you to enjoy while here in Charleston. There is always a lot of fun happening out at Folly Beach from bars to hop to, restaurants to try and of course the beautiful beach to enjoy. it is a party place so spending your bachelorette weekend here or a girls weekend- you will definitely have a GREAT TIME! When you start to plan your weekend in Charleston you might start to get a bit overwhelmed with what to do. There are LOTS of options so figuring out the best things to do for the short amount of time that you are here can be hard. We want to make that easier. 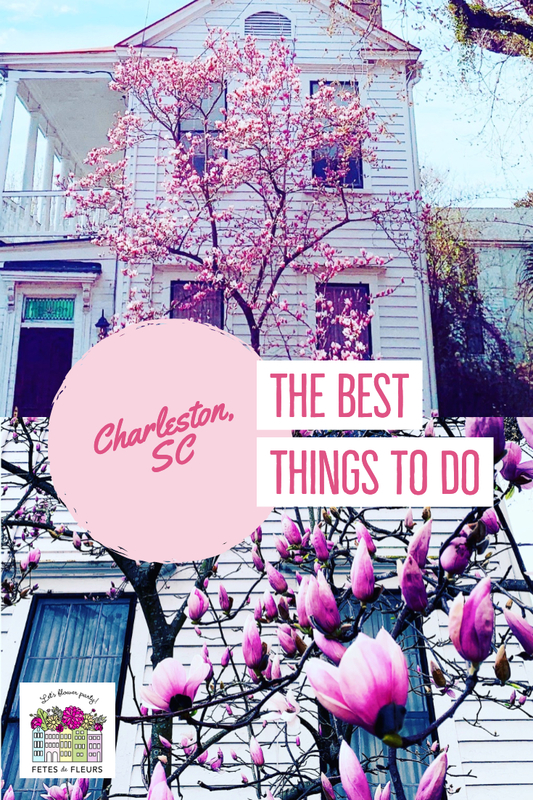 We thought we would help you out by providing you some of our favorite things to do for a bachelorette party in Charleston or a girls weekend down south for this Spring or Summer ahead. This Charleston bachelorette party decided to go with real flowers in white and green with some touches of pink! We always try our best to make sure our parties get what they request, but sometimes depending on season and stock, the flower Gods just don't have what we need! Luckily for these ladies, the spring season had plenty to offer! 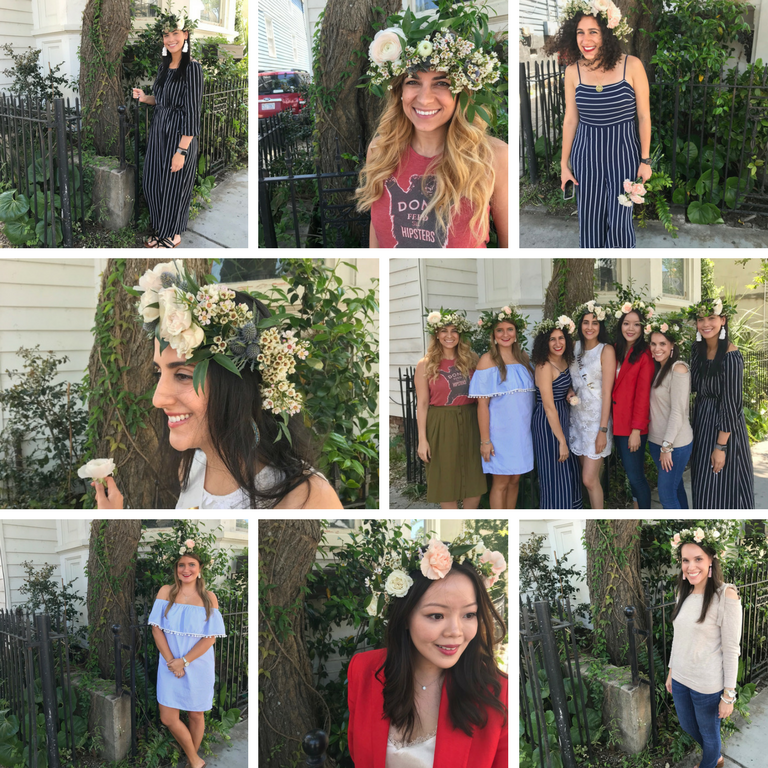 Request More Info About a Charleston Bachelorette Flower Crown Party Here.